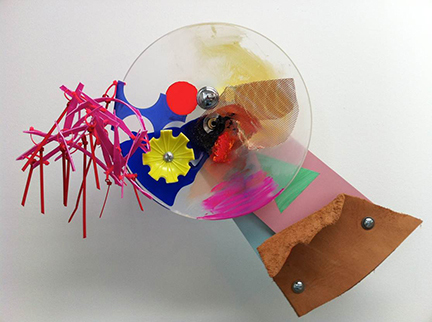 Barbara Edwards Contemporary, Calgary, is pleased to present a solo exhibition of new sculptures and works on paper by internationally renowned artist Jessica Stockholder. 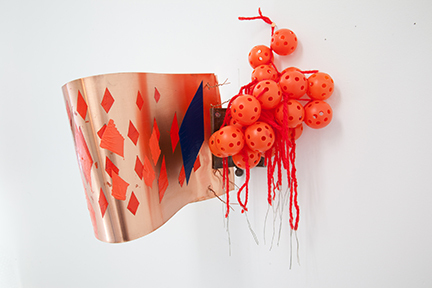 Known for her investigations that bridge the realm between painting and sculpture, Stockholder explores the emotive capacity of ordinary objects and materials through colour, form, and composition. Void of their original utility, rubber balls, carpet, and household plastics, become elements of vibrant, abstract assemblages. 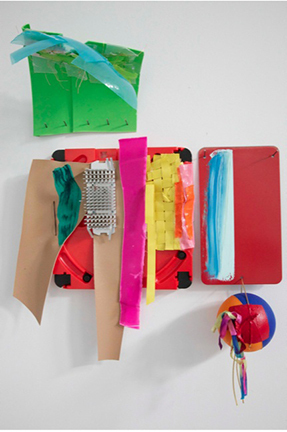 Jessica Stockholder was born in Seattle and grew up in Vancouver, British Columbia. In a recent interview, Stockholder remarked that, “the landscape and the culture of Vancouver have everything to do with who [she is].” She studied painting at the University of British Columbia and completed her BFA at the University of Victoria. In 1985 she received an MFA from Yale University where she then worked as professor and Director of Graduate Studies in Sculpture. She also received an honorary Doctor of Fine Arts degree from the Emily Carr College of Art in 2010. Stockholder is currently professor and Chair at the Department of Visual Arts at University of Chicago. She has exhibited throughout North America and Europe, most notably at the Venice Biennale; the Centre Pompidou in Paris; Dia Centre for the Arts, New York; the Power Plant, Toronto; the Art Institute of Chicago; P.S. 1 Contemporary Art Centre, New York; and the Whitney Museum of American Art, New York. Her work is held in significant collections including the Art Institute of Chicago, Vancouver Art Gallery, the Whitney Museum of American Art, and the Stedelijk Museum in Amsterdam. 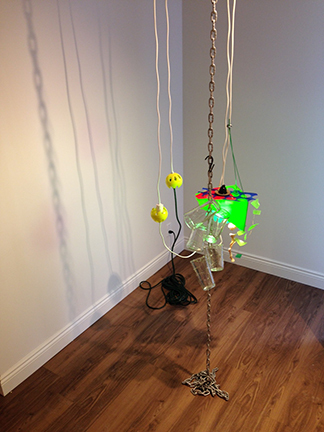 23" x 17" x 7 1/2"
metal chain, electrical cord, fluorescent bulb, fixture, plastic parts, drinking glasses, wire, shells, ceiling height x 19" x 21"